By Sue Chan - New Zealand - 22 Jun/03 - Viewed 1798 times. Bypassing Picton we arrived at Blenhiem at 10.50 and although it is known as the sunshine capital of New Zealand we were feeling the cold so changed back into warmer clothes. After smoko in Seymour Square near the fountain we continued through to the coast at Wharanui where the picturesque church of St. Oswald, built in 1927, stands by the side of the road. 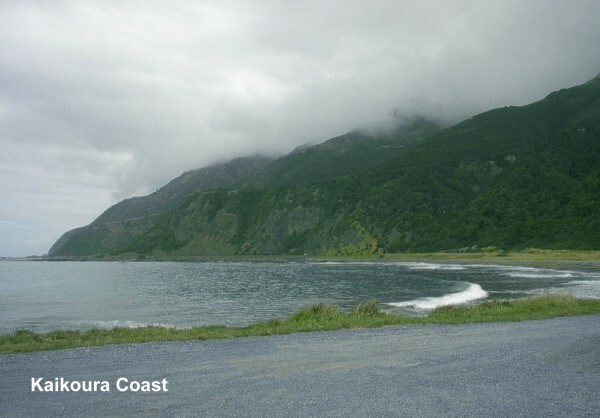 This coastal stretch of the SH1 runs for 100km between a wall of mountain and the Pacific Ocean and several tunnels have been carved through the hills to carry both train and vehicular traffic. Before reaching Kaikoura we stopped at Ohau Point to see a seal colony, our first look at seals in the wild. Kaikoura, in 1987, began New Zealand�s first commercial whale-watching trips but there was not a seat available on one until 4pm so, as we still had a long way to go, we sat in the sun overlooking the beach and had lunch then moved on. It was a pleasant drive down the coast although we thought not spectacular and we arrived at Christchurch by 5.15pm after travelling 441km. We had very little trouble finding Elizabeth Park Motel at Avondale, which runs parallel to and only metres from the banks of the Avon River, thanks to help of a map taken from the internet. Floor to ceiling windows with a sliding glass door allowed access to the river and after settling in and having a rest we went for a walk along the path. Although the brochure said New Brighton was within comfortable walking distance it seemed a long way but quite enjoyable. It was very quiet with everything closed late on a Saturday afternoon � no night life here � and we made our way through the mall to the pavilion on the beach. A new pier was opened in 1997 with 17 piers at a cost of $4million, half the cost being met by the council and half by subscription. There is a paved courtyard with the names of those who made donations permanently recorded on the pavers. We were out about 2 hours and walked almost 4 km. Christchurch was founded as a Church of England colony in 1850 and is named after England�s Oxford University College, where the city�s founder was educated. The City Centre is about a 15 minute drive from Elizabeth Park Motel and as we left early next morning � Sunday � there was not much traffic about and we found our way easily. There is free parking in the City on Sundays so we left the car in the street and after consulting our book decided to see the furthest historic building first. The Cathedral of the Blessed Sacrament, opened in 1904, was quite a distance away. It is listed as one of New Zealand�s finest classical buildings and the most important church in Christchurch with a superb interior. As a service was in progress we could not see inside. After McCafe we explored Cathedral Square then followed the route of the City Walk, past the Arts Centre, formerly Canterbury University, to the Botanic Gardens. Here we walked to the river where we saw visitors enjoying a ride in a punt while the boatman did all the work. Again following the walk we marvelled at the extent of the buildings in Christ�s College grouped around a grass quadrangle. This school dates back to 1863 and is the oldest educational building still in use in the country. We passed the Provincial Government Buildings the only surviving provincial government buildings in N.Z. (The country was governed as a group of provinces from the early 1850s to 1876.) After again crossing the Avon we soon arrived back at Cathedral Square. The Cathedral, which dominates the square, was begun in 1864 at the heart of the original settlement. Electric trams came to Christchurch in 1905 but the network was closed in the early 1950s. Now, restored vintage trams take tourists on a newly created scenic route through the city. We left the City at 1.15pm to drive to Lyttelton. (We didn�t quite make it) First we came to Ferrymead Historic Park, a Museum of Transport and Technology opened in the1960s with a collection of around 60 nineteeth-century buildings. In the Moorhouse Edwardian Township there is a Church and a Cob Cottage, the type of dwelling built in the1860s of puddled clay and straw. Curragh Cottage, next door, originally imported in prefabricated form from England, is much more grand. Across Stewart Street are a row of business premises including the Bakery, Picture Theatre and the Printers. This is a �working� museum that includes operating trams and a steam train and as it was Sunday there were many volunteers to show us around the recreated township. We visited the Printing Shop, and saw many old machines that are kept in working order by the Printing Society. At the Telecom Museum and Post and Telegraph Office, the home of the Post and Telegraph Society we were able to buy stamps especially printed and perforated for Ferrymead at the Printers next door. We passed the stables with staff in period costume and came to the �Hall of Wheels� the Museum of Road Transport and then the �Hall of Flame� the Vintage Fire Engine Museum. A member of the Fire Services Historical Society showed us around the fire engines and told us this was the largest collection outside the U.S.A. Many organizations from Christchurch have their premises here and there were many more places we could have visited including the Aircraft Hangers, Model Cars and Trains and the Photographers. Near the Lyttleton tunnel entrance at Heathcote a road branches off to the foot of Mount Cavendish where the terminal of the Gondola is situated. This Gondola climbs 500m above sea level to the Complex at the top of the mountain where there are extensive views north across Christchurch and south across Lyttleton and the Banks Peninsula. We rode to the top and had afternoon tea at the Summit Caf� � expensive but very nice � before going outside to admire the views. On level four we went through the Heritage Time Tunnel with dioramas of Maori legends, the boat trip from England to New Zealand and the early settlements. There was also a display of flora and fauna as well as the geology of the area and its formation by earthquakes million of years ago. We decided not to go down to Lyttleton as we had seen it from the viewing platform and found a ring road, which took us back to Avondale. Later we went to dinner at the local pub where we had a lovely home-style meal of chicken and roast vegies.